This road trip involves some pretty lengthy distances, so if you have time on your side feel free to break them up as you wish. It takes you up the Queensland East Coast, past the sunny surfing spots in the south to the Great Barrier Reef country in the north, showing you all the sights on the way. Just a short run up the highway from Brisbane is the Sunshine Coast, a strip of gorgeous beaches that borders a lush, green hinterland. Leave early so as to enjoy as much time as possible in this special part of Australia. Soak up the laid back vibe in pretty coastal suburbs such as Caloundra, Maroochydore and Noosa, and enjoy a surf in the renowned swell of the Sunny Coast. There are plenty of places to park up your campervan and spend the night, but we would suggest staying in Noosa as its on the northern end of the coast and leaves you with less distance to travel next. 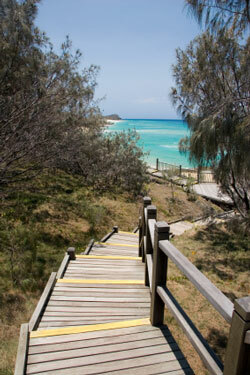 Renowned as being the largest sand island in the world, Fraser Island is a popular tourist destination. Accessible by ferry from Hervey Bay, you need to know that only 4WD vehicles can access the island because of the sandy road conditions. There are a number of designated camping regions on the island, but remember to pay your fees to the Rangers. Enjoy touring through the thick and lush forests, and definitely pay a visit to the fresh water lakes in the centre of it. If you don�t make it to the island and stay in Hervey Bay, then hire a tinny and enjoy some good fishing. If its whale season then you are in the right place- this is the whale watching capital of Australia! If you do make it to Fraser Island you will need to spend a couple of days there to fully appreciate it. Once you are back on the mainland then its off north once again to your next stop, Rockhampton. �Rocky� is the capital of beef farming in Australia, so you are bound to enjoy a good steak here. They often hold rodeos in town, which are good fun to watch. The town sits on the banks of the Fitzroy River, which is very popular amongst fishermen for the large populations of Barramundi that inhabit it. This is the longest stretch of your drive, and you will notice the scenery beginning to get more tropical as you proceed. That said there is not much to see on the way although you could pull into Mackay for a break. Airlie Beach is a couple of hours north of Mackay, take the sign posted right turn at Proserpine. Known as the gateway to the Whitsunday islands, Airlie is a popular tourist town especially among the younger generation of travellers. It has a buzzing nightlife and a wide range of activities, and is a good base from which to pursue aquatic activities such as snorkelling, sailing and scuba diving. The Great Barrier Reef is also accessible from here.